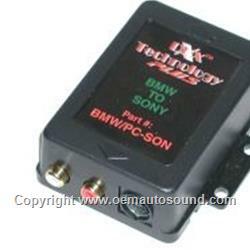 All BMW are pre-wired for the 6 disc CD-changer 6 and 3 pin are terminated behind CD-changer trunk trim cover in the left side (driver side) of trunk. As an auxiliary input converter. This device allows you to plug in an external audio source, like an iPod, iPhone, portable Mp3 player, satellite tuner and DVD players. Plugs in at factory Bmw changer cable. No need to splice into BMW factory wiring. Not compatible with models equipped with Dsp. 3 & 6 pin connector in rear drive side of the BMW trunk. If vehicle has existing CD-changer, it must be disconnected.